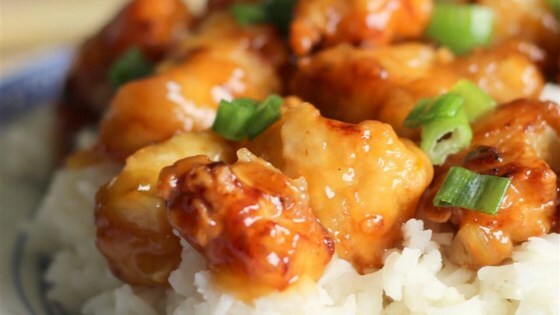 "A delicious citrus chicken recipe with flavors reminiscent of the orange chicken from a popular restaurant in the mall." Pour 1 1/2 cups water, orange juice, lemon juice, rice vinegar, and soy sauce into a saucepan and set over medium-high heat. Stir in the orange zest, brown sugar, ginger, garlic, chopped onion, and red pepper flakes. Bring to a boil. Remove from heat, and cool 10 to 15 minutes. Place the chicken pieces into a resealable plastic bag. When contents of saucepan have cooled, pour 1 cup of sauce into bag. Reserve the remaining sauce. Seal the bag, and refrigerate at least 2 hours.